The high-tech Juggling Jukebox literally wires a human performer to a musical vending machine. The juggler's motions--translated into digital signals--control the music. A frozen juggler--evocative of an unplugged robot--springs to action when viewers insert money in the bill changer and press a selection button. After a series of intricately choreographed "mechanical" juggling tricks accompanied by interactive electronic music, the jukebox returns to its static position. 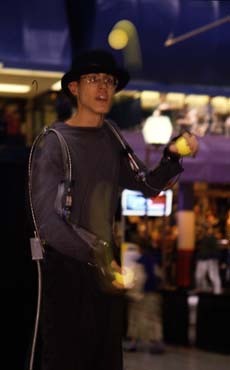 A revolutionary advance in juggling technology, the high-tech Juggling Jukebox is the first juggling act in the world to use body motion sensors. The game-changing shift in interface technology is like the advance in user experience from traditional mobile phones to the sleek iPhone. The jukebox also fuses vending and entertainment in a unique way--wiring a live human being to an electronic coin changer and bill validator. Philosophical and artistic overtones can be found in this fusion of human and circuit board, but the Juggling Jukebox focuses on pure entertainment. Laughter is, after all, the only way to reconcile transforming a human being into a vending machine. The music for the Juggling Jukebox is shaped by the juggling itself. Palm triggers and arm-flex sensors control mechanical sounds and an algorithmic score. Musical inspiration for the songs derives from sources as diverse as Stravinsky and spy movie scores. The juggling consists of abstract mechanical movements punctuated, occasionally, by more literal references to cranks, pendulums and so on. The patterns underscore the musical drama with attention to rhythm and phrasing. The overall design aims to make the technology visible while referencing vending machines, robots and the archetypal traveling entertainer (via the traveling case aesthetic). "Juggling Jukebox" is a trademark of James Jay.